Today, there are many discussions focused on next generation broadcast formats. This is mainly driven by the fact that the consumer industry has already launched 4K (UHD) TV sets. Beside the question is the market ready to accept a new broadcast format? One question still remains: what is the best solution for the next generation broadcast format? Is it just the double pixel count in horizontal and vertical direction? Will a higher frame rate and/or a higher dynamic range and extended color range provide viewers a higher value? Will all these improvements need to be included in a next generation broadcast format? The answer will likely depend on the type of production and content delivery. On the acquisition side, there are many physical limitations, and as a result more compromises will need to be made. For example, to keep the sensitivity and the dynamic range at todays levels, the pixel size cannot be reduced from the current 5m. However, if a four-times higher pixel count is requiredthe pixels would need to be four-times smaller to fit the same size imager. This will have a direct impact on sensitivity and dynamic range and with todays technology this is not a solution. If the pixel size will be kept, an imager with four-times more pixels will need to be four-times larger, which means instead of todays 2/3 size, the imagers would come close in size to the Super35 image format. But for the Super35 format, no lens exists to support a three imager solution based on a prism beam splitter, because all the available lenses which support larger imager size have been developed for still cameras and film camera applications. Plus, the relatively short flange-back of these lenses does not allow the addition of a prism beam splitter in-between the lens mount and the camera imagers. This will therefore only allow single imager solutions with a color pattern filter in front of the imager such as a Bayer pattern filter. The higher total pixel count will need to be divided into the three primary colors and then a higher resolution can be achieved by some image processing techniques which partly estimate where an object in the image might have been. These solutions have some severe side effects and are not always predictableleaving all sorts of challenges for live production. In addition, there are no large zoom range lenses available for these larger sized imagers because its not possible to build them in a reasonable size and for an acceptable cost. And with a larger sized imager comes the larger focal length needed for the same angle of view, which translates into a shorter depth of field. This is often required with film productions, but with live productions the reduced depth of field leads to a much more difficult focus setting. Furthermore, any new format will be a progressive format and CCD imagers do not offer an acceptable performance level. Today, CCD-based cameras achieve an acceptable level of performance only in the interlaced formats where they add the signal charges of two adjacent pixels together doubling the sensitivity and the dynamic range. CCDs operating in a progressive format offer only half the sensitivity and dynamic range as in the interlaced formats. The LDX Series¢ of advanced imaging cameras from Grass Valley® operate with FT CMOS imagers, which always work in a progressive format with the same sensitivity and dynamic range found between both interlaced and progressive formats. The high performance of the FT CMOS imagers in combination with the global shutter behavior of the Xensium-FT imagers offer a perfect basis for the next generation broadcast formats. This provides the potential for high-speed operation, and high dynamic range with a higher resolution that provides a new user experience especially for all live broadcast applications. The LDX Series and LDX Compact¢ series of cameras offer more. With the wide range of 3G transmission solutions, the unique XCU concept and eLicense upgrade system, they already represent the most flexible and powerful camera system on the market and in addition they are the perfect basis for future developments in many directions. 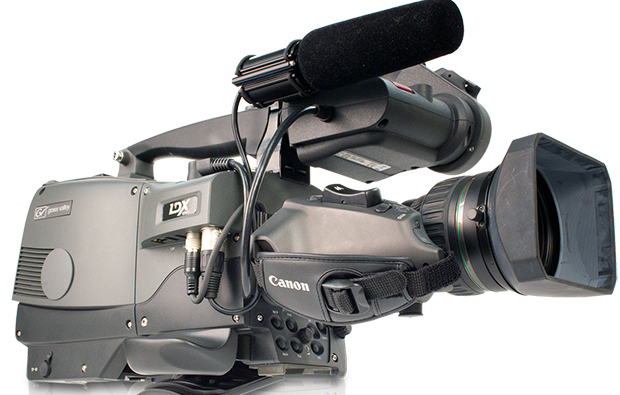 The LDX Series offer the perfect solution for the next generation image acquisition for live broadcast.